I hope everyone had a wonderful weekend! I had a great time catching up on the #SUMMER10x10 feed and reading through everyone’s different experiences. This challenge seemed to fly by faster than ever before and it was nice to have a moment to let it all sink in. Once I began exploring all the posts I was so pleasantly reminded of the true extent of this community and how this challenge brings people together, from all over the world, in such a fun and friendly way. I’m honoured that so many of you have been open to giving my random idea of picking 10 items, to wear in 10 looks over 10 days a genuine try. So thank you SO MUCH for trusting me, my amazing co-host Caroline and anyone else who encouraged you give it a go. From the looks of things it’s been a helpful exercise for many of you and we couldn’t appreciate of your participation more. If you didn’t try it this time, no worries, maybe we can convince you to give it a go next time around. We’ll be back this Fall! But now it’s time to recap this latest 10×10 experience. I’ll be sharing some of my personal style findings and some of the great insights I came across in the 10×10 Community. 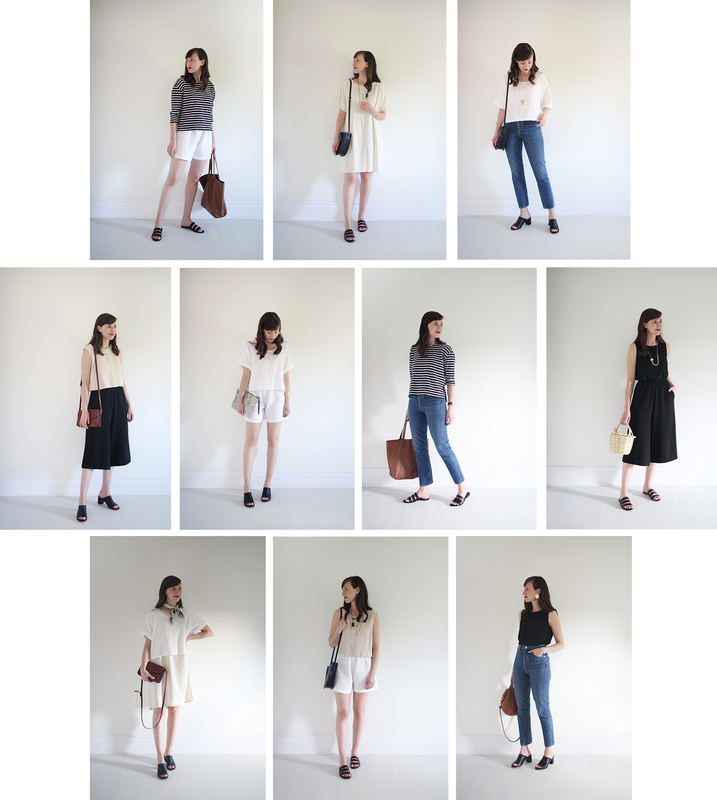 These are the 10 items I chose to style into my 10 different looks. | CROPPED LINEN T-SHIRT | c/o LLOYD CLOTHING | $110 CAD | Made in Vancouver | OS | Style Bee readers save 10% OFF sitewide at LLOYD with ‘STYLEBEE’ (ends tonight)! 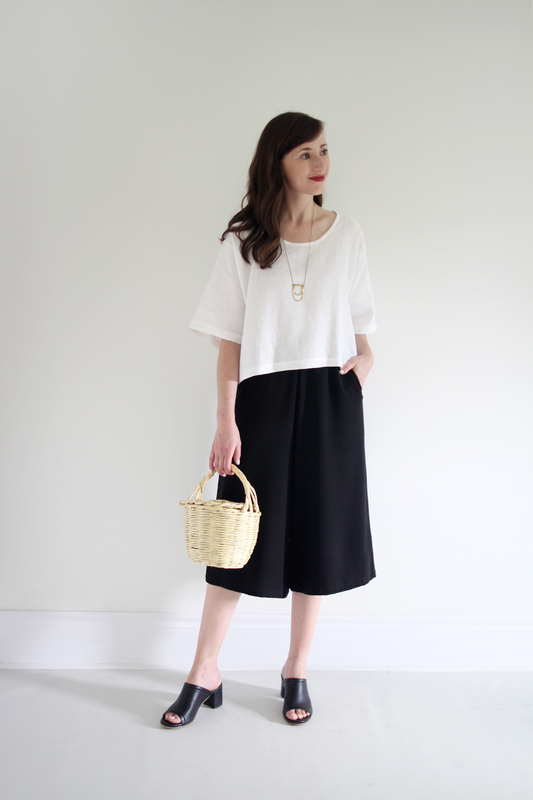 | BLACK CULOTTES | JESSE KAMM | s/o | Similar by EILEEN FISHER ($238 USD) by EVERLANE ($68 USD) and these from BRASS ($82 USD) look awesome! | CAMILLA SLIDE | NISOLO via GARMENTORY | $88 USD | I wear a 7 | Made responsibly in Mexico | Save $20 OFF your first order when you sign up here. 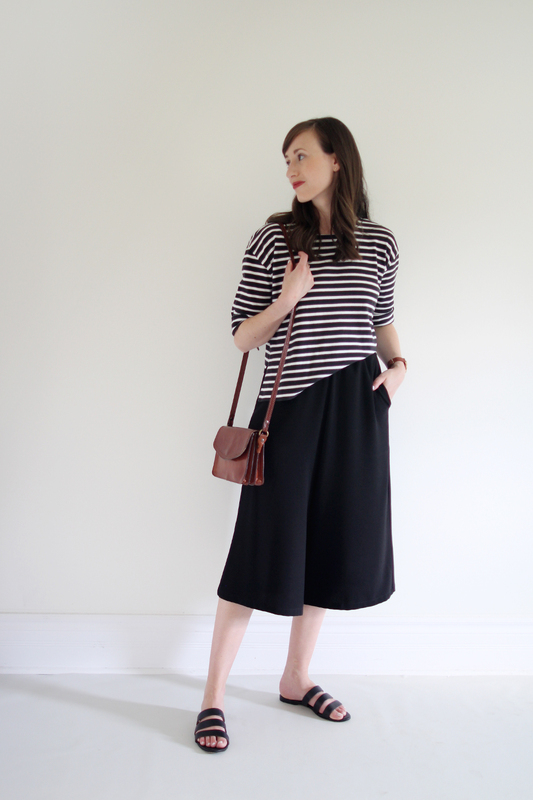 | SUMMER SHORTS | c/o LLOYD CLOTHING | $160 CAD | Made in Vancouver | I wear a size S | Style Bee readers save 10% OFF sitewide at LLOYD with ‘STYLEBEE’ (ends tonight)! Here’s how I used those 10 items to create 10 different looks. You’d think after doing this challenge so many times already (the current count is 9 times! ), I’d have nothing left to discover. Instead, I’ve found that every time I try it out, I learn a few new tricks, find a new favourite look and feel reassured of the style principles I’m already applying. 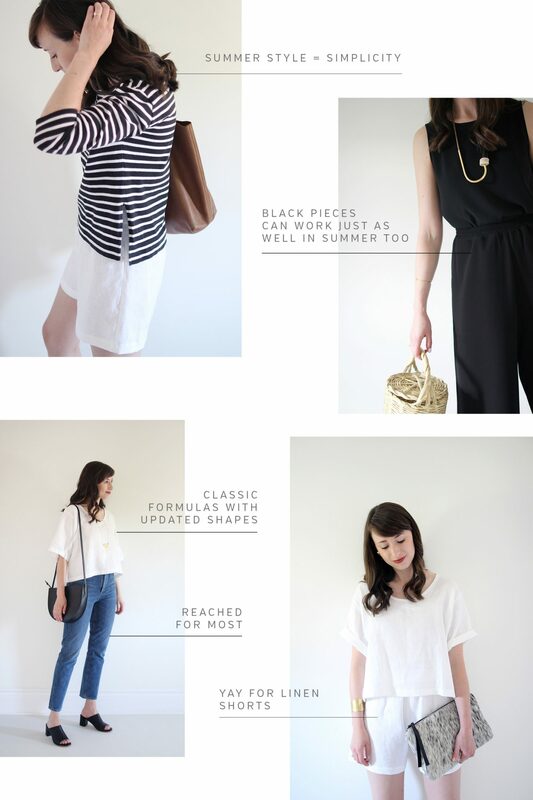 I see merit in old pieces and find ways to incorporate new items into my closet seamlessly. I find this challenge also reinforces impulse control and encourages me to look closer at what’s in front of me, instead of seeking satisfaction via shopping. Sure, there are lots of temptations, especially within such a stylish community but it’s all about appreciating how others work with less and how you can too! I’ll admit I popped into a few local shops during the challenge (but managed to walk out empty-handed) and my online window browsing certainly didn’t come to a screeching halt. However, ultimately, I did find more contentment from this challenge and can absolutely see more potential in the pieces I chose than I would have otherwise. It’s called a ‘challenge’ for a reason. There are meant to be times when it’s not a breeze or when you have to work past your instinct to give up. Sure it’s just about clothes and fashion but it’s also about perseverance, working within boundaries and pushing yourself to try new solutions. If it was easy peasy and took no willpower there probably wouldn’t be much to learn from it, right? THE GOAL I SET FOR THIS 10×10 CHALLENGE WAS: Get more comfortable applying my personal style to warm weather. It didn’t take long to start seeing answers to this style conundrum and throughout the challenge I picked up lots of ways to feel more comfortable staying true to my personal style, while embracing the summer season. I usually end a challenge with a few more looks I could have tried and this one was no different. In fact, I could have easily gone for another week without repeating any outfits! But here are a few that I just had to try out before saying hello again to the rest of my wardrobe. In addition to these three, I would have liked to try my Petra Crop, Jeans and Slides and my Georgia Dress over my Jeans with Mules for a look like this. Alas, I’ll just have to test those two out on my own time! Well it’s no surprise but you guys knocked this Summer 10×10 Challenge out of the park! I continue to be so inspired by your brilliant styling and how you put pieces together. 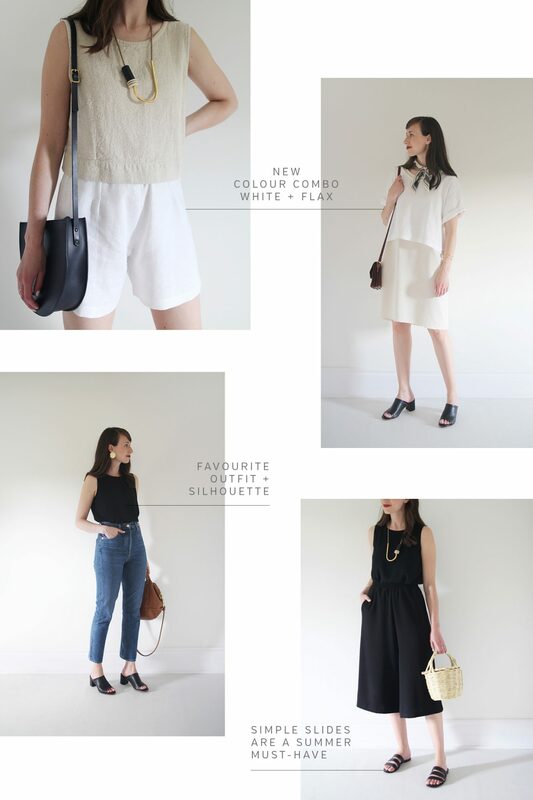 I was so honoured to see a few of my own style tricks making their way into your outfits too! Just like last time, I was agonizing over how to choose photos for this grid. But I set a timer for myself (again!) so I wouldn’t spend the entire day on it. So really, this is not my ‘favourites’ or necessarily the ‘best’ outfits, they were just the ones I managed to screen grab from the dozens of open tabs before the timer went off! That said, these looks are pretty freaking awesome. Thanks again for putting yourselves out there and taking outfit photos for this challenge. I know it’s not everyone’s favourite part of the challenge but I truly believe it makes a big difference to see how our clothes are working on us and in action. Your candid opinions and day-to-day experiences were so helpful too, as always. I love that this community is a place where we can express how style influences our daily life (for good and bad), ask for feedback and share openly. THANK YOU ALL SO VERY MUCH FOR BEING A PART OF THIS 10×10 CHALLENGE! You folks really said it best when it came to your experiences throughout the challenge. 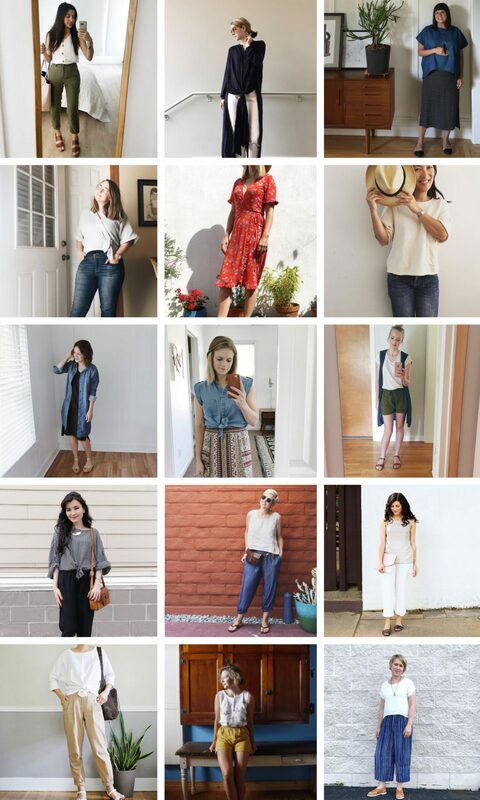 I couldn’t help but capture some of your clever insights and style sentiments to share here. There are SO many more where those came from too, which is amazing! Thank you for sharing! If you’ve got more to share about your experience I’d LOVE to hear about it! Feel free to share in the comments. Before the challenge started, I honestly wondered if I should do another one. I didn’t see any thing else I could possibly learn, and I don’t know that it necessarily helps with my writing rut. But I’m so glad I did. It forced me to hone in on the summer style I’ve been craving and makes me hate the heat a little bit less. While I generally style high-waisted pants with tops tucked in, I’m surprisingly loving how billowy and carefree this outfit feels. This type of going outside my comfort zone to find other styles I really love is exactly why I love the #summer10x10 challenge. The 10×10 always teaches you something new. This time I learned that sometimes an item of clothing remains unworn in your wardrobe for a good reason. I’ve developed my personal style so much since starting to take part in these challenges. I no-longer make purchases based on what’s in fashion at the time, but rather on what matches my style and existing items in my wardrobe. I have “met” so many friends through taking part in the 10×10 challenges. I feel that I am now part of a genuine and supportive female community from across the globe. I love it! I realized during this challenge that I no longer enjoy wearing t-shirts to work. I’m going to take that as a definite sign of adulthood ?. This has been so much fun to learn more about my wardrobe and connect with others who want to do the same. This was my first 10×10 and it was a little rough at times, but so happy I did it. Its been such a revelation that I can wear nice tops with shorts! A key takeaway from this challenge for sure. 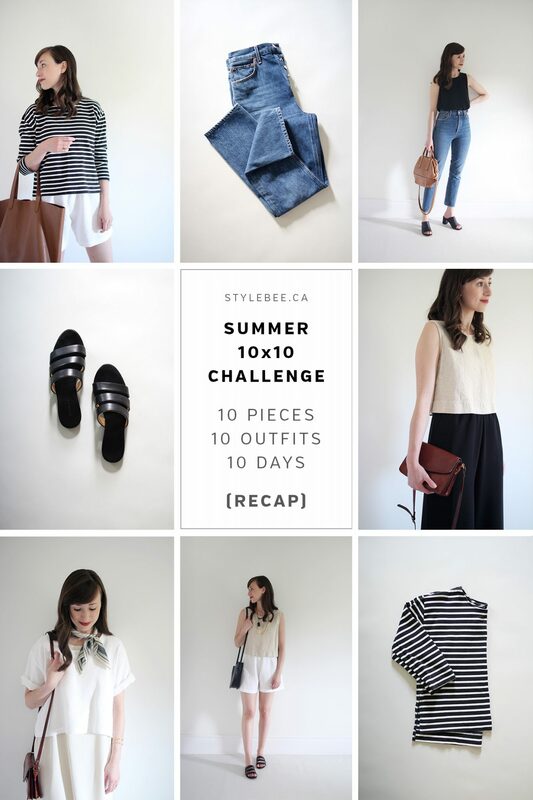 I’ve seen some awesome summer looks by my #10x10friends, but I realize that I don’t have a lot of those pieces that they do. Instead of feeling down that my closet has all these holes that I need to fill immediately ?, I’m simply embracing the fact that while I don’t have a lot of pieces that can be put to double duty and remixed a ton of ways, I do have a lot of great classic pieces that I *love* wearing in the summer. Minimal and me ☺️Not what I expected to learn this go around, but regardless, I learned something and came out more content from where I began. So much easier to travel light and I really don’t mind wearing the same thing everyday anyway. I supposed you never know until you try, right? When I restrict myself and have less options, I end up with much more creative and thoughtful outfits…that I usually end up loving! Summertime=sweat=laundry. This time I had to wash every piece (except jeans) after every wear. That was tricky! 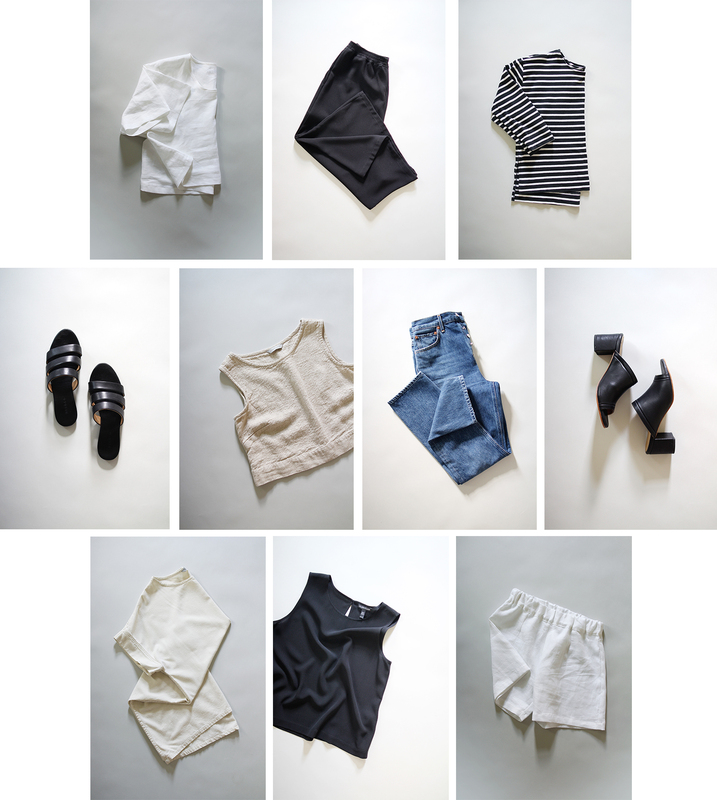 I’m working toward a capsule-like closet, but 10 items is a bit too restrictive for my mama life! This challenge came at the perfect time. Daniel and I are in a season of very tight budgeting and as much as I would love a closet of all the ‘right’ clothes, it just isn’t in the cards currently. So, I’m learning to love what I already own and respect the life of the garments already hanging in my closet. I’m kind of sad it’s over (I really love maximizing and playing with my wardrobe?) And thanks to everyone that has been involved in this community in any way, for the inspiration, the help and the awesome tips! It’s really fun to be part of this and to share together our passion for style, slow fashion, and versatile pieces. I’m so glad that this exercise gave me opportunity to play with wearing separates, since I tend to gravitate toward dresses in the summer. This is one outfit I would have never put together by just looking in my closet. But seeing them beside each other in my 10 x 10, it was an obvious choice and I absolutely love it. I loved this challenge and enjoyed the overall lightness and fun of it. The best part is it set me up perfectly for summer travel and I couldn’t wait to compile a travel capsule for an upcoming trip! It really helped me get my mind in zone of pushing pieces to do more for me and being able to travel light without feeling like I have to sacrifice style or comfort. I’m not going to lie friends, I’ve been in a bit of a frazzled mindset lately. With the wedding fast approaching and literally every weekend booked up before the ‘big day’ I’m trying to relieve my schedule of any undue stress. So with that in mind I’ll be reducing my posts to just 1 – 2 a week for the month of August and into September. This Friday I’ll be sharing a new 1 Formula – 3 Ways post because I love creating those. Then next week I’ll share what I packed for my bachelorette weekend (so excited!) and a new Life Lately. I’m currently compiling the pieces I’m ready to part with for a Style Bee closet sale, which will most likely happen on August 18th. Then I’ve got more travel posts planned, a fun collab, an interview with a favourite accessory brand and some other good stuff cooking. I hope that sounds good! THANKS AGAIN TO MY AMAZING CO-HOST CAROLINE OF UNFANCY FOR ANOTHER WONDERFUL 10×10 CHALLENGE! DON’T MISS CAROLINE’S RECAP POST TODAY TOO. I’d love to hear about your 10×10 Challenge experience! Did you love it? Hate it? Learn something from it? Please feel free to let me know in the comments below. I totally missed this round of 10*10 challenge!! Wanna join next time!! Wow! I am new to your blog and just discovered it today. I must say – I am extremely impressed! What a lovely post. I was traveling for most of the summer without reliable wifi so I had no idea about this 10x10x10 challenge. Really inspirational. Love your layout. This was my first time participating in a 10×10, and honestly, I kind of just jumped right in. I had no plans of participating until two days before it started, when I picked out my 10 items for the upcoming two work weeks. The funniest thing I experienced during this challenge (where I learned so much, and took more risks in shapes and combinations of items than I normally would for my lifestyle) what that when it came to an end, and I had to pick out clothes this week… I literally didn’t know where to start! I didn’t have set items out in front of me from which to choose outfits that I had probably already been starting to formulate in my head. It was such a strange and funny feeling! I will definitely be participating in this again. 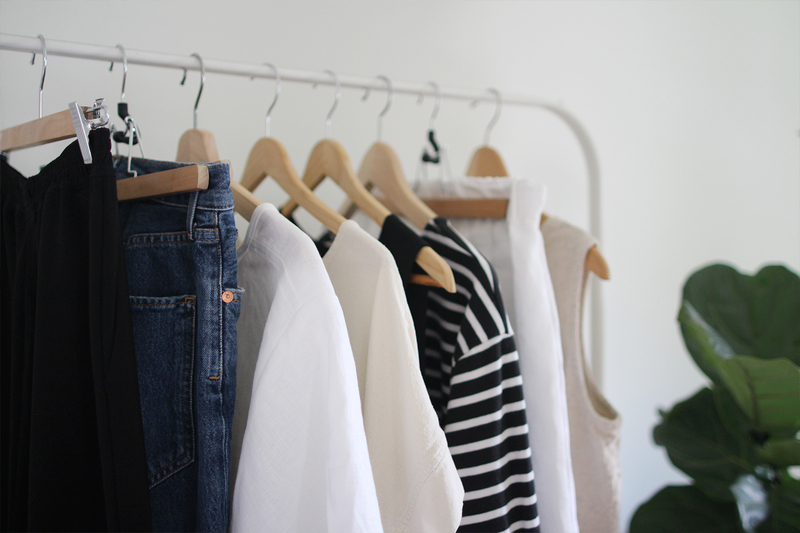 It truly has been the perfect introduction to living with a minimal wardrobe, which is something I am slowly trying to work myself towards. Lee, thanks so much for hosting this with Caroline! I always love reading your takeaways! Although I didn’t participate this round, I’m actually going to make a public account specifically for next time! Really want to get the full engagement with such a wonderful community 🙂 Thank you for bringing everyone together! Best wishes to you for the wedding planning and the big day! Super excited for your formula post (those are SO helpful)! I didn’t participate this time around but felt a little bit of FOMO this time because I didn’t. Gals get so creative during this experience and it’s awesome to see what they can pull off! This one was definitely my favorite 10×10 to participate in! After doing it a few times I feel like I understand more what pieces I love and can put into interesting outfits. I totally didn’t follow the no shopping rule though. I had to pre-order one of the gorgeous black Jamie and the Jones Heavyweight T sweaters. I absolutely love that they traced it all the way back to the growing of the cotton, and couldn’t resist buying myself a Christmas present! Though I didn’t play along this round (at least not “officially”), I loved following along here and on IG! 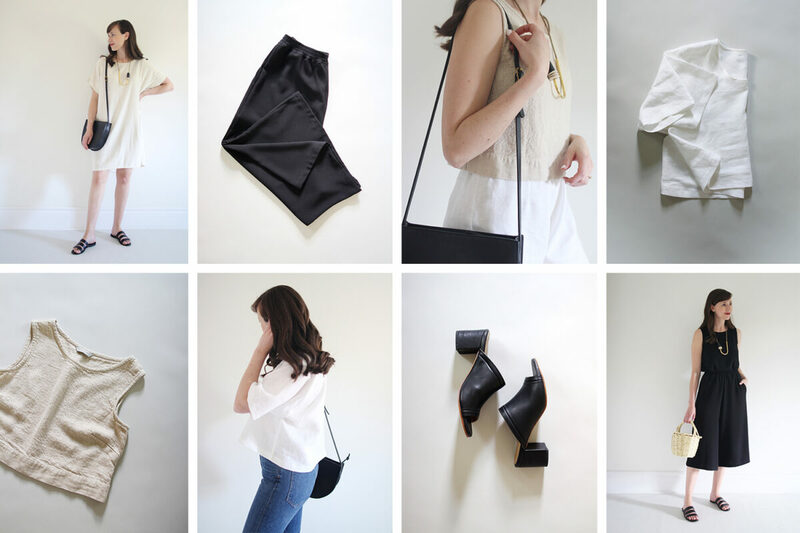 Especially love your takeaway on summer simplicity and your new white + flax combo. I’m awaiting my first pair of ES pants – they’re in mid-weight linen and flax (both of which are also new for me!). Thanks as always for the inspiration and fun, Lee! Thank you Lee for hosting this challenge and quoting me! It’s an honor since I’ve been reading your blog for the last year or so. You’ve been such a great influence for me for finding your own style and sustainable/ethical shopping, quite life changing. It’s such a great learning experience and social one, too. 🙂 Good luck with all of the wedding planning! Best of luck with all the wedding planning – the wedding-planning part seems way scarier to me than actually being married! Marking my calendar for August 18! Thanks Krystal! I couldn’t agree more haha. It’s shaping up to be a great day and I’m trying my best to take it all in stride.